Okay so I am a huge red lipstick lover. I have easily 15 red lipsticks. 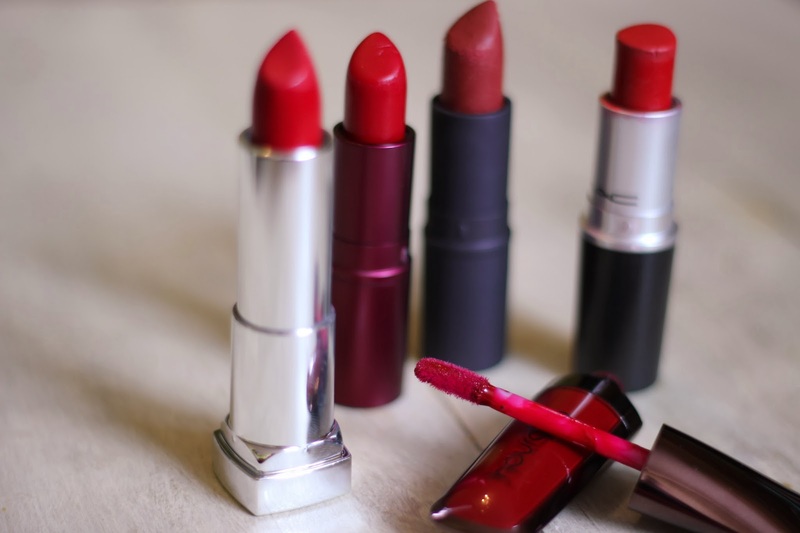 Actually I think my first ever lipstick was a red lipstick...maybe not but I know I've been wearing red lipsticks for almost the same amount of time I've been wearing makeup...(8 years). I go with a blue red, it's just going to look better. On me anyway, orange reds look so bad on me that I am biased against them & I'm pretty sure that pink reds should just be called berries. Yes I have very definite opinions on red lipsticks. Deal with it. Blue undertoned lipsticks whiten your teeth & pop against most skin tones beautifully. Generally speaking the darker the red the more likely it is that the red is blue toned but if you are confused go to a counter & ask. Generally going to a counter & asking is a good idea if you are getting your first red or if you are not confident in what red will suit you. Orange reds can be very flattering as can pinks but true reds & blue reds suit everyone & that's what I'd always recommend. My favourite reds are mostly dark blue reds that are full on & matte. I have dark hair with very pale skin so a red usually has to be a 'go big or go home' type red or it just looks washed out & half assed. I say mostly because one of my favourite reds is sheer, another is moisturising & the third is a kind of, just off rusty colour. This is a buildable, moisturising lipstick formula (really lovely). The colour is a dark, blue red with an almost berry-ish feeling. Being a moisturising lipstick it does have a little bit of a tendency to get everywhere but it doesn't dry out your lips the way some matte formulas do - you win some you loose some. I would buy this lipstick again in a heart beat (it's very cheap & a great colour). 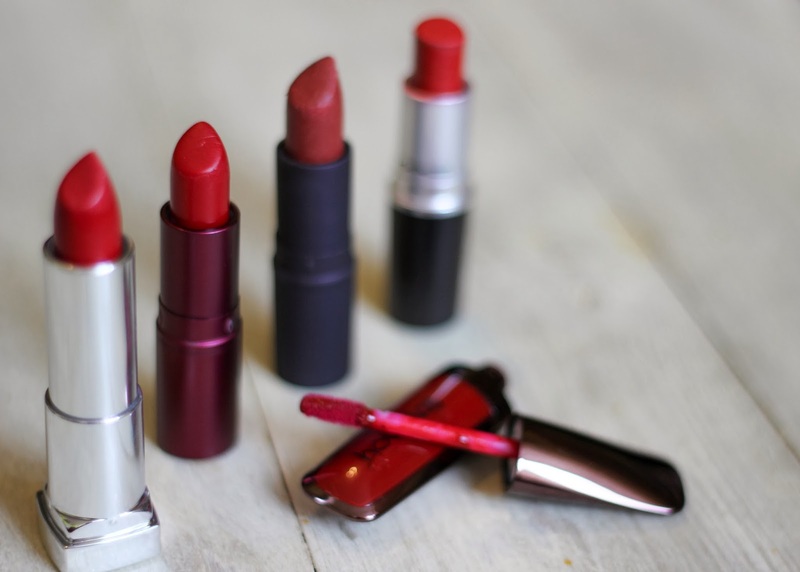 Totally sheer red lipstick. I really am not sure why I love this so much because it is not me, at all! But I don't know, there is something cool about this my-lips-but-better red. It's a great lazy day colour, maybe not worth the money but I just think it's awesome...it makes me feel like a Victorian woman hiding her makeup in the knicker draw & buying it under the counter (a little makeup history for you there). I don't know that I would buy this again, it gives a look that is totally achievable with other products, but I love it & cherish it. I think I would buy this lipstick again, it is a basic that I don't know that I would ever want to be without. My top two lipstick are so close in my affections that it was hard to make a decision. This is number 2 only because the colour isn't a true red. It's a real rust type of colour, a red-brown colour that has a my lips but better feel. The formula is amazing & I will so be getting more reds in this formula. 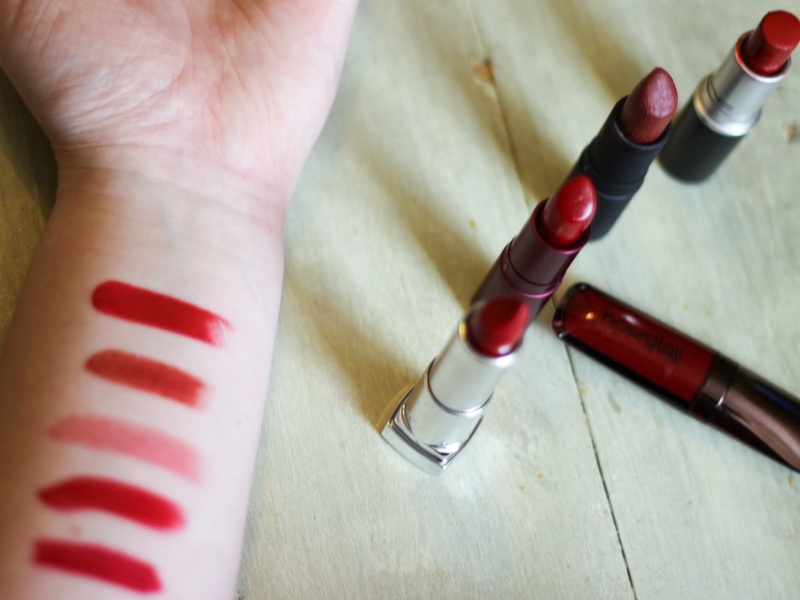 More info on both of the Lipstick Queen lipsticks on the review I did a while back. I would 100% buy this red lipstick again - the bullet is by no means beautiful but the lipstick is crazy awesome. It's dark, it's blue toned, it's even darker on the lips & it's very very red. It's a little more berry-ish than Russian Red or the Maybelline one but it's stunning. Only problem - it can get a little patchy but all you have to do is apply a little lipgloss over the top & it's fixed. I might not buy this again, it is very price-y but since my brother bought this for me out of guilt I might persuade him to do that again....anytime I run out of this, lol.